Israel's Prime Minister Benjamin Netanyahu is reiterating the importance of Israeli and American cooperation in the battle against what he called "militant Islam" in the Middle East, saying the two countries must stand together to ensure "light triumphs over darkness and hope triumphs over despair." He also emphasized the importance of preventing Iran "from ever developing nuclear weapons. Speaking Monday via satellite to the annual policy conference of the American Israel Public Affairs Committee, Netanyahu called on the United States to "vanquish" the so-called Islamic State group and build alliances with moderate Muslims to make sure IS does not return. "We must ensure that the forces of militant Islam are defeated," Netanyahu said, adding that Iran can not be allowed to "drag humanity away from the promise of a bright future to the misery of a dark past." He thanked President Donald Trump for his vocal support of Israel and U.S. Ambassador Nikki Haley for boycotting a U.N. standing agenda item that requires the Human Rights Council to debate Israeli human rights abuses against Palestinians, the only one of its kind. "Israel wouldn't be the country it is today without the steadfast support of the United States of America," he said. Netanyahu pointed to Israeli aid in Africa, intelligence shared with foreign governments and natural disaster relief rendered by the country to illustrate Israel's contributions to the world. "In this battle between modernity and medievalism, more and more countries realize that Israel is on their side," he said. 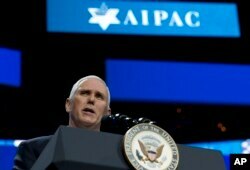 Vice President Mike Pence speaks at the 2017 American Israel Public Affairs Committee (AIPAC) policy conference in Washington, March 26, 2017. A day earlier, Vice President Mike Pence said the Trump administration "has put Iran on notice," and will not tolerate Iranian efforts to "destabilize the region and jeopardize Israel's security." Pence said U.S. commitment to Israel is "non-negotiable," and that President Trump is committed to finding a lasting peace between Israel and the Palestinians. He also said the president is seriously considering moving the U.S. embassy from Tel Aviv to Jerusalem. Such a move could gravely impair peace efforts, with Palestinians viewing East Jerusalem as the capital of their state under a two-state solution. Netanyahu called on Palestinian leaders to recognize the Israeli state and work on a peace deal. He said common dangers faced by Israel and its Arab neighbors offer a "rare opportunity" to work towards a more safe and prosperous future. Pence also reiterated the administration's opposition of the deal the U.S. and five other nations struck with Iran during the administration of former President Barrack Obama to curb the Iranian nuclear program in exchange for sanctions relief. The vice president criticized what he called the "disastrous end" of economic sanctions that were put in place amid allegations Iran was working to develop nuclear weapons, which Iran has denied. The AIPAC conference opened just days after a bipartisan coalition of U.S. senators introduced legislation calling for new sanctions against the Islamic Republic, targeting Tehran's ballistic missile testing and its alleged support of terrorism. People protest outside of the Washington Convention Center where the 2017 AIPAC Policy Conference is taking place in Washington, March 26, 2017. Outside the conference venue, several hundred protesters from the anti-Israeli occupation group "Minot" marched, some of them carrying placards and banners denouncing Israel's occupation of the West Bank. One banner read, "Jews Won't be Free Until Palestinians Are. 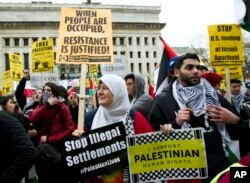 Reject AIPAC, reject Occupation."